Al is still considering a run for the Democratic Nominee in ’08! The minister and civil rights activist avoided party politics during a high school assembly to honor the Rev. Martin Luther King Jr. He encouraged students to further King’s legacy of nonviolent activism. “Reach out and learn in your own way to exemplify the tolerance that Martin Luther King showed,” Sharpton said. But later in Hanover, speaking to Dartmouth College Democrats, Sharpton’s remarks turned political. “George Bush, after spending the week lobbying for (Supreme Court nominee Samuel) Alito, justifying wiretaps and explaining for the thousandth time why he did not respond to Katrina, will stand somewhere on Monday and piously act as though he remembers Dr. King, when in fact, he has stood against everything Dr. King represented,” he said. Speaking to a reporter later, Sharpton laid out his priorities for the Democratic Party, tying them to King’s work. “A tone should be set about reviving the King agenda of social justice and fairness,” he said. 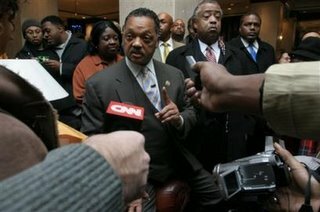 Al Sharpton has not yet decided if he will seek the Democratic nomination in ’08 or not.